Join Jenn Mair for an interactive, full body work out with pumped up music! This class incorporates weighted drumsticks for a unique, fun filled workout for your entire body! 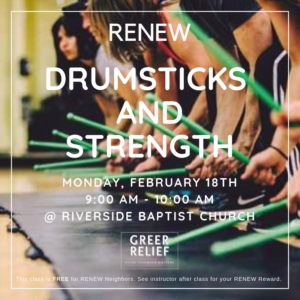 This class will be on February 18th from 9:00 AM – 10:00 AM at Riverside Baptist Church.